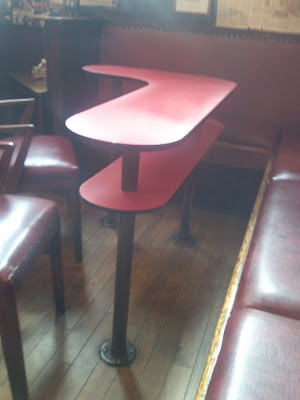 -Rounded corners on a table in a bar. Who would have thought it !! -Size - big enough to get drinks on but no need for a full dinner table. 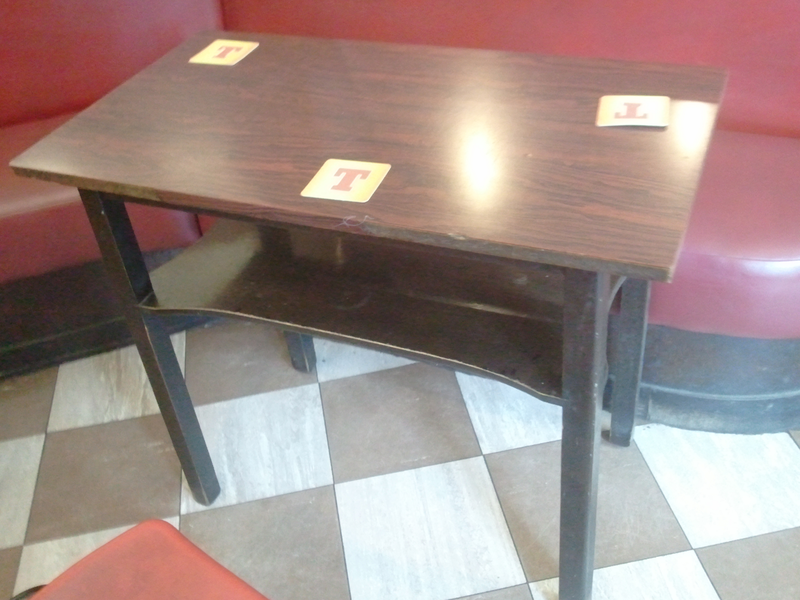 Bus your own table and dont start a dirty glass collection on it. -Two levels - used to be just for newspapers, now stick a phone away from the drinks ( How about a glass top to see the phone as well )(so you dont forget it) Stick a phone charger in there as well. - Not too many . 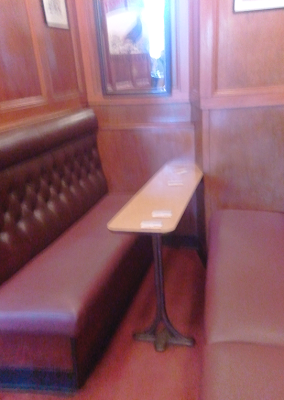 Enough room for people to stand without someones backside in your face. 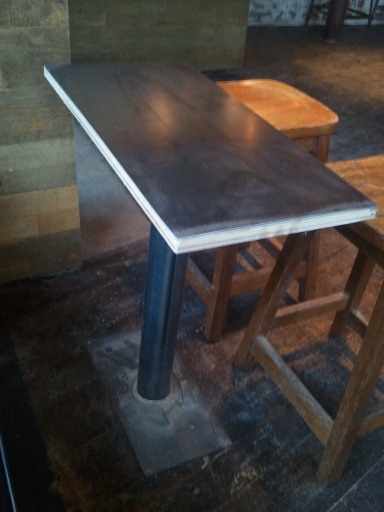 Table engineering at its finest. 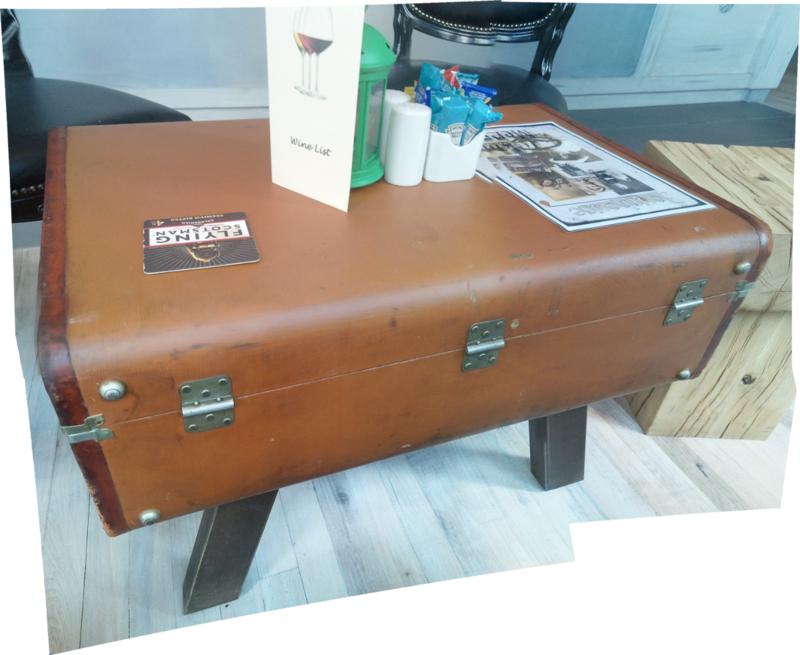 Rounded, storage, fits the bar and just enough in number. 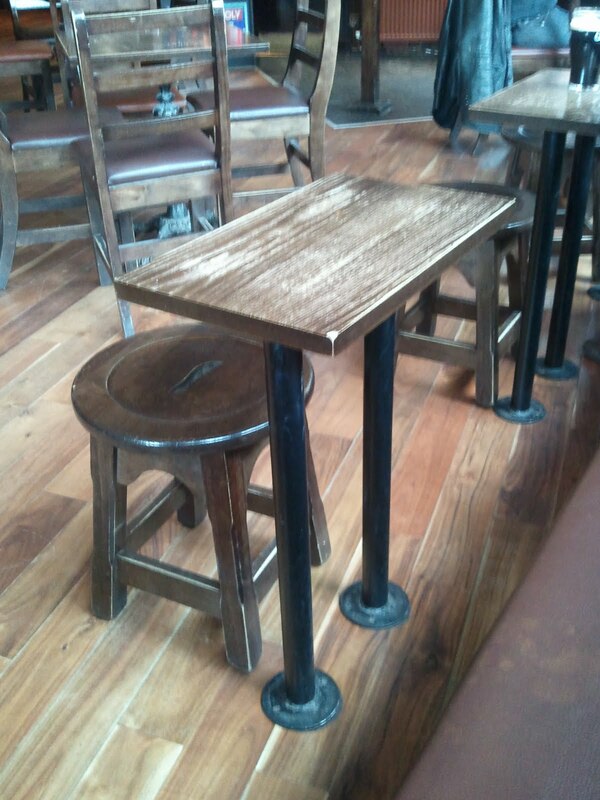 Tables to inspire. 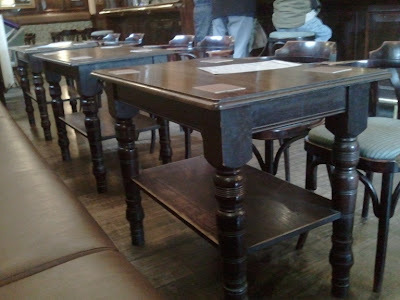 Great tables,. Rounded, Storage underneath with plenty of leg room if needed. 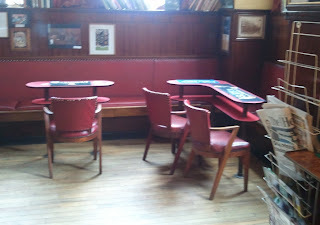 Angled table in corner. 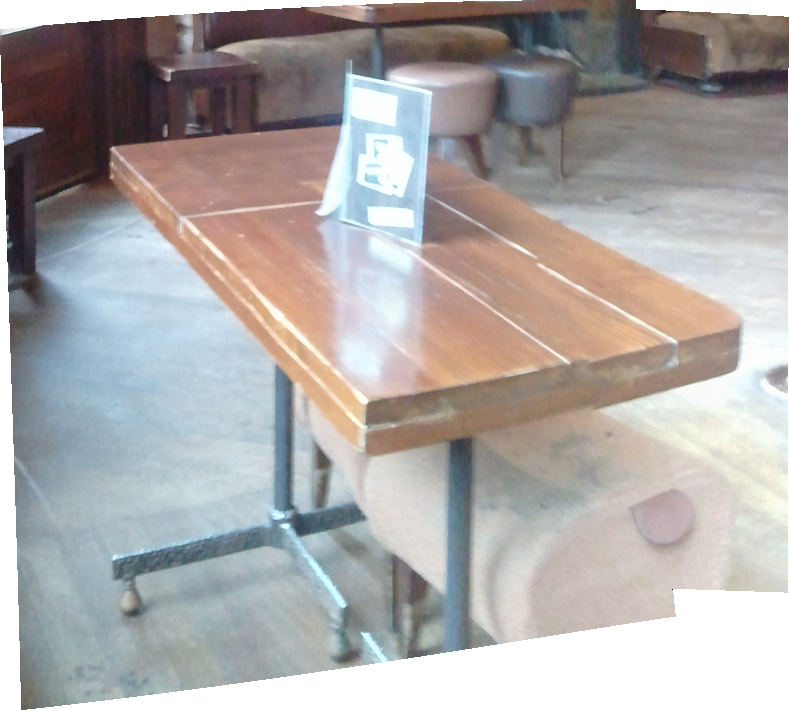 Just enough tables in the bar. 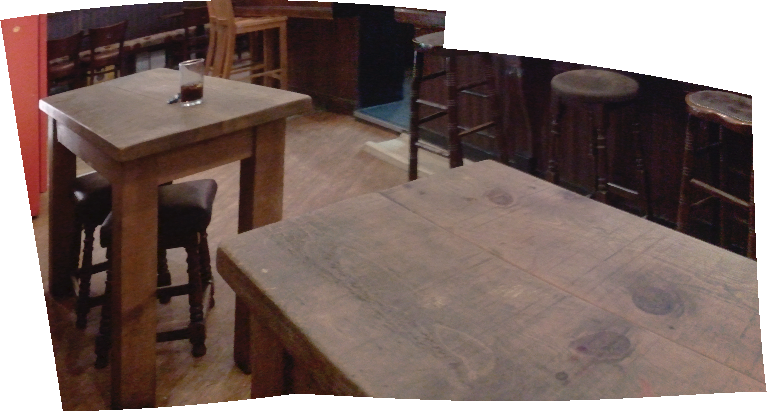 New bar ( June 2014 ) , my favourite of general tables in bars. 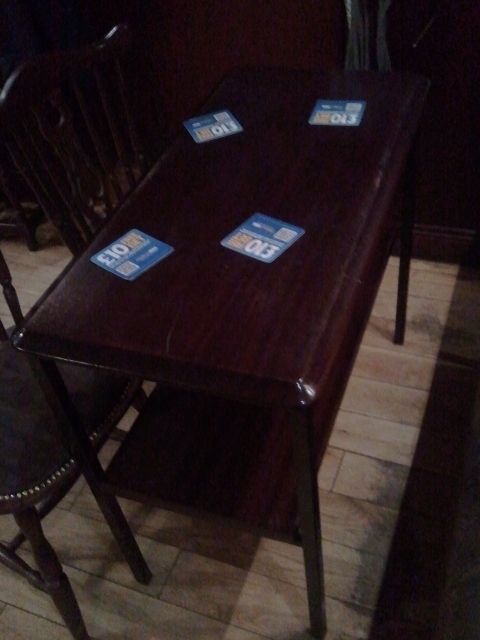 High finger tables. Gets people close enough to talk, enough space for drinks. People can stand or sit. Rounded end, I think these are better than booths. More. adaptable . 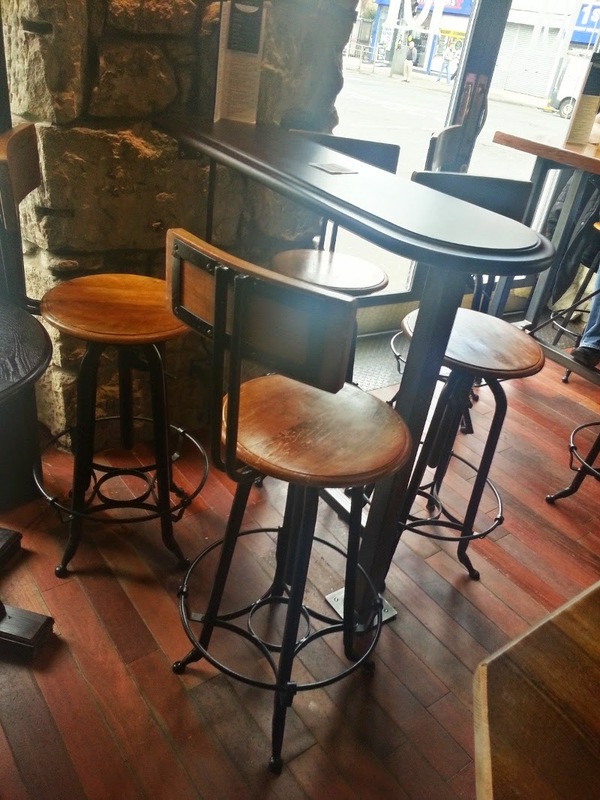 Dont have the problem of lower tables at the inside looking at high tables in the middle and making people miss the bar experience by staring at peoples backs. 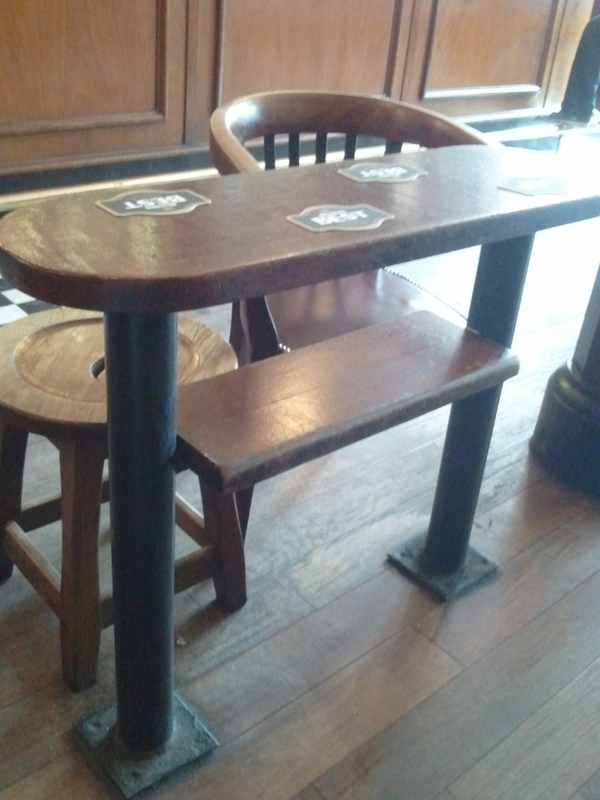 If these had a split level , which higher tables can easily do and not lose leg space ,they would be fantastic. Cell phone storage and safety from spills is an issue these days more si than newspaper storage. A wee rounding of the corners and these would be even better. The legs could be a bit more substantial but still great tops. Legs like the Three Judges tables. Of course these tables have none of the above but good solid tables. A bit low for leg room . Also you can see why rounding the corners works, these have been knocked and worn so why not do it first. Also you cant catch your leg on the sharp corners. Wow. 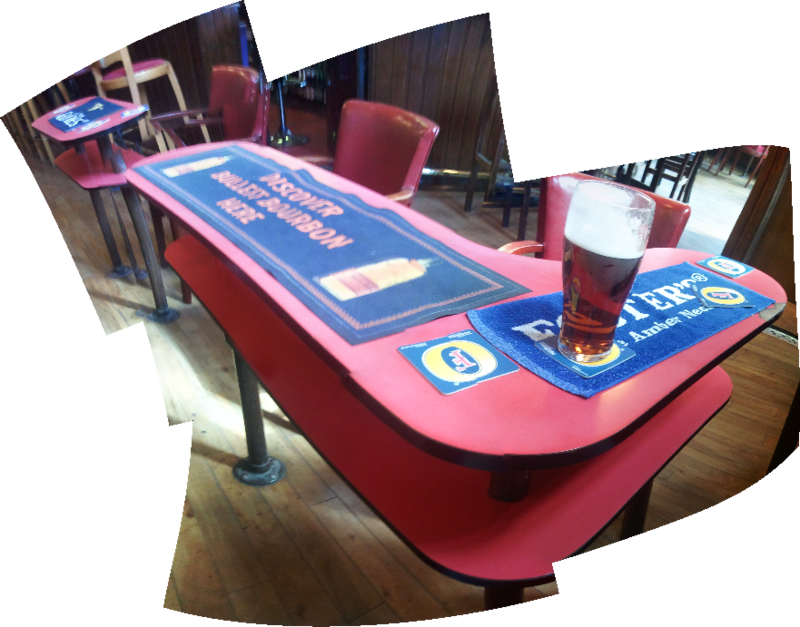 Great tables. Rounded corners, Solid, Bit underneath. Everything about them is great its just that they are 3 feet from the seats. I am tall so they are sort of okay for me but you end up a long way from your fellow drinkers. BIg tables. They serve food ( 2.50 for a three course lunch !! ) so they need to be. Lower level which adds a nice little detail; a slight cut in to accommodate the tops of your legs. 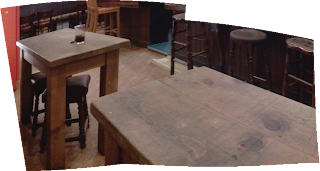 Good tables that fit the age of the bar but with some rounded corners to match the style of the bar they could be better. 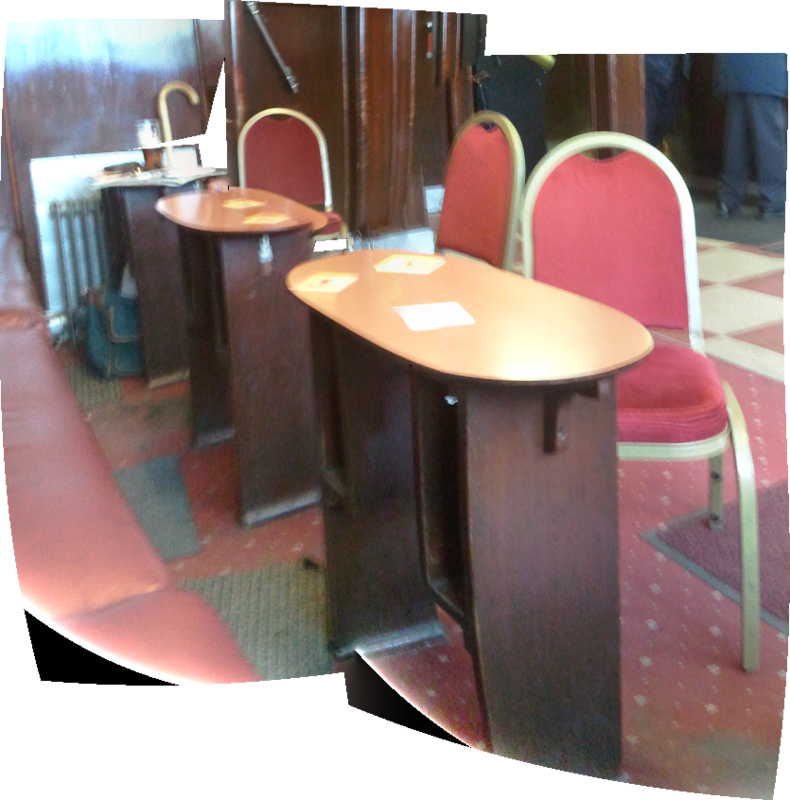 Let down by the chairs though. 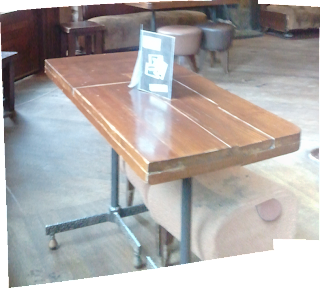 Big tables ( They serve food so no problem with that) Lower shelf. 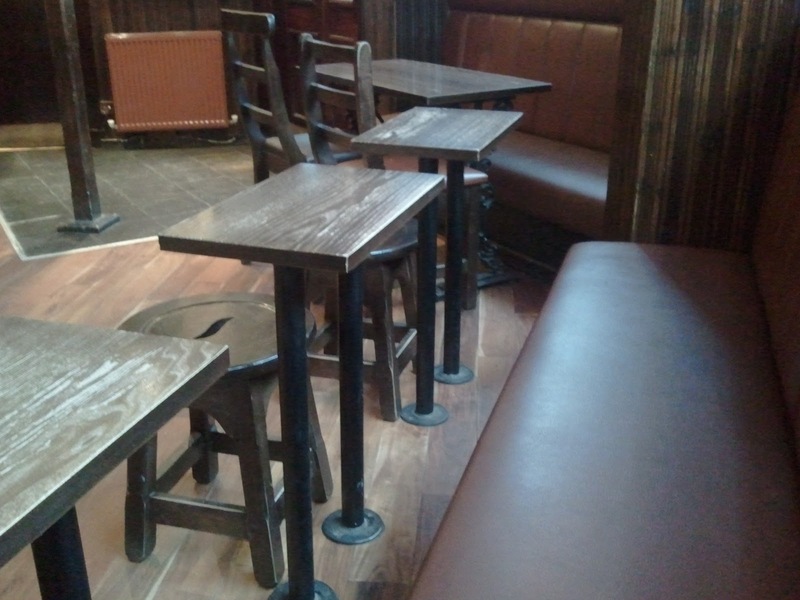 Nice tables . I nice modern updating on other designs. Could do with having the corners knocked/routered off though.